Toad lilies also make great cut flowers so you can have orchid like flowers in floral arrangements which lends a bit of the exotic to your other more ordinary cut flowers. 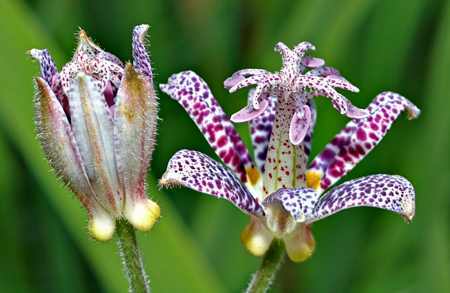 If you are not familiar with Tricyrtis, also known somewhat unfairly as the Toad lily, this is a plant you will want in your garden. These little Asian gems have quickly gained a foothold in todays gardens, and deservedly so. Toad lilies are relatively easy to grow, multiply quickly, thrive in the shade – a plus for gardeners working with such areas, and bloom late in the season when most other shade perennials are already done for the year. They will adjust to different soil, can tolerate heat, cold, and humidity and they require little maintenance. Belying its name, the blooms actually look more like tiny orchids rather than toads. 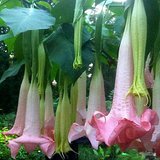 The exotic starry or bell-shaped flowers are set amidst dark green and attractive foliage and occur in a wide range of colours, usually spotted with a contrasting colour. 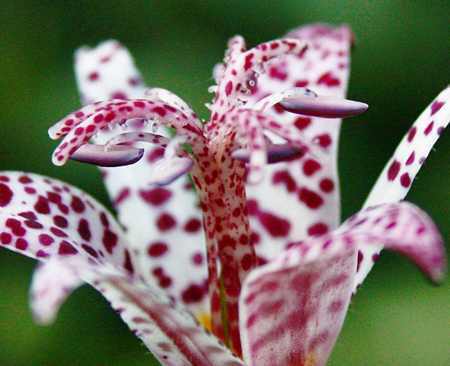 Tricyrtis are perennial herbaceous plants that grow naturally at the edge of forests and their native range is from the Himalayas to eastern Asia, including China, Japan, Philippines and Formosa. They like rich, well composted, moist soil and as long as they get part shade and are kept moist, they can grow in almost any climate. 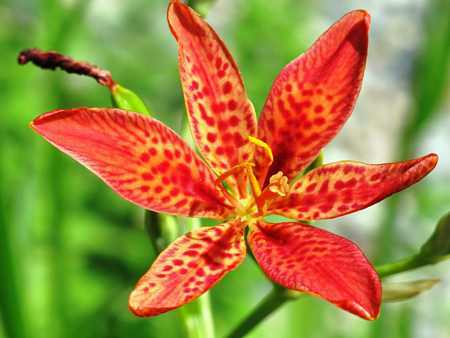 So plan on brightening your shade garden by planting some toad lilies this spring. In the late summer and fall, the impressive foliage and unusual blooms will make you glad that you did. Tricyrtis species are all herbaceous plants growing from rhizomes which are normally available from spring through summer (If you cannot find it at your local garden centre, consider doing an online search). 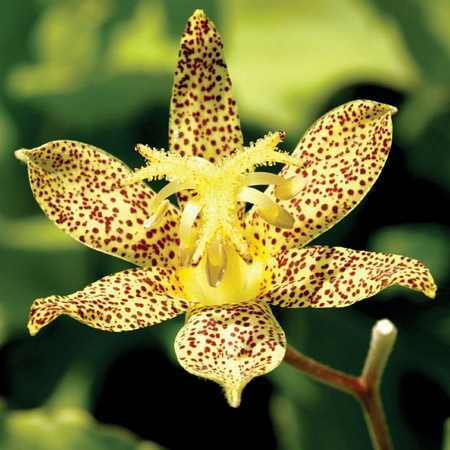 When you buy Tricyrtis rhizomes they are like a Lily of the Valley in that you want to plant the pip side up and about three inches (7.5 cm) deep. Space plants at least a foot apart to give them ample room to grow and good air circulation. Keep the plants well watered for the first summer while they become established in your garden. After that you can water less frequently, but never let the soil dry out completely. Toad lilies grow to be 2 to 3 feet (60 to 90 cm) tall and as wide, so they are a good size for containers or smaller garden areas. With their 1 to 2 inch (2.5 – 5 cm) flowers they are not showy plants, but a close inspection of the flowers reveals a fascinating structure. 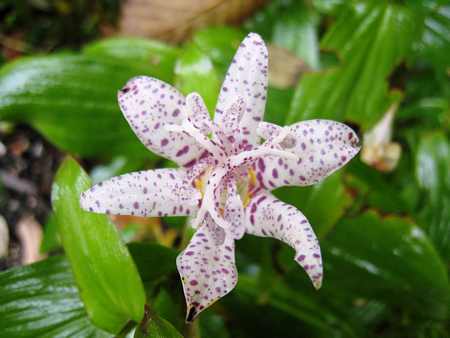 Be sure to plant your toad lily where you can see and appreciate the breathtaking detail of its flowers. Toad lilies form their own clusters and are unique enough that one plant can stand alone as a centerpiece or specimen plant. Established toad lilies may have as many as two dozen of flowers splayed out along the stem when they come into bloom and they will bloom for up to six weeks. Even when your toad lily isn’t blooming, its foliage remains a showy accent in the shady garden. 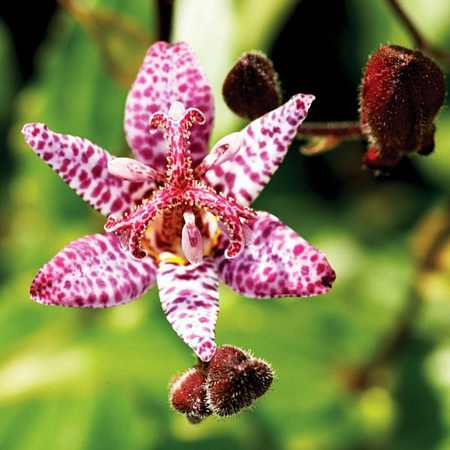 Plant a variety of other shade-loving plants around your toad lilies. Hostas, astilbe, hellebores, erythroniums, bleeding hearts and ferns are among the plants that make good companions to toad lilies. These all share the same cultural requirements, which makes group plantings that much easier to maintain. And with this kind of mix, you can have a long season of blooms in your shade border. 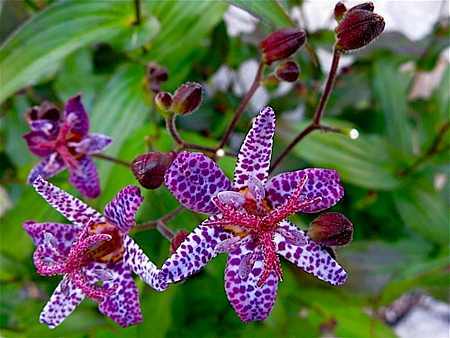 So if you want something truly exotic looking in your yard, and something that looks tough to grow, but in reality is as simple as planting it, then give Tricyrtis a chance to perform for you and dazzle friends and family with your gardening skill. 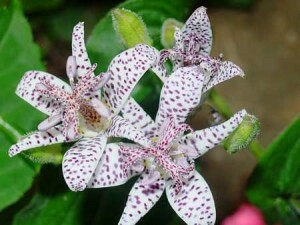 If you get it in the ground this spring, you are sure to enjoy toad lily’s magnificent blooms this year, and for many years to come. Tricyrtis hirta, the hairy toad lily. 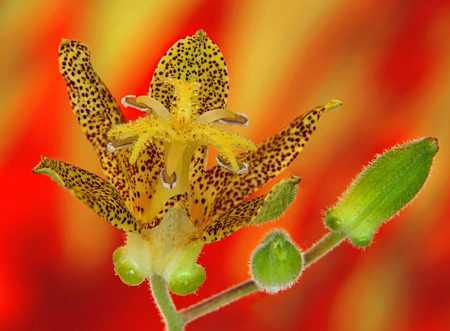 Gardening Spain Toad Lillies Tricytrtis are relatively easy to grow multiply quickly thrive in shade.